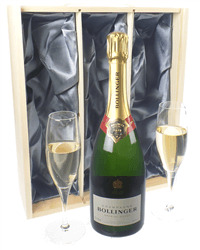 Another limited edition gift from the House of Bollinger. A full size bottle of Bollinger Rose together with 2 Bollinger flute glasses presented in a beautiful Bollinger gift box. Send a bottle of Champagne with two flute glasses as the perfect gift for any occasion. 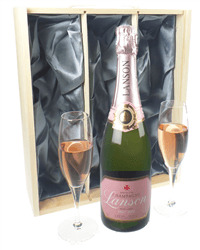 Presented in a choice of silk lined wooden boxes with plain flutes or as a branded coffret gift set with branded flutes. Our range of Champagne gift sets with flute glasses includes Brut, Rose and Vintage Champagnes from Veuve, Bollinger, Laurent Perrier and many more. Order online or by phone and we will deliver to the address of your choice, carefully packaged with your special gift message.